Why might you want to use the Six Hats? You are out of ideas, and need to generate some. The team has become too cohesive, in the sense that everyone tends to think the same on issues. You have to resolve a task-related conflict over how to approach a project and there is no clear solution. You need to solve a problem, and the approaches which you usually use are not fruitful. The team is spending too long in unproductive meetings. We’ve laid out a fairly strict way of doing things here, on the thinking that when you start using an unfamiliar process it’s easier to have a set process to begin with, and then deviate from it as you become more familiar, experienced and fluent. Set a time for a meeting, with a specific agenda. Explain that you will be using the Six Thinking Hats in this meeting, and include the information on how the Hats work (see below). We would suggest keeping the meeting to an hour or less to begin with. We’d also suggest that you don’t make an emotive conflict the agenda for your first use of the Six Thinking Hats — maybe leave that for a bit later. Introduce the meeting’s purpose, with one clear sentence, e.g. “The goal today is to generate ideas to help us solve problem x”. Frame the process as a game. Games have rules. If you are the person running the session you are the Blue Hat. Everyone else in the session will be another hat, but only one shared hat at a time (i.e. everyone is the White Hat, then everyone is the Red Hat). 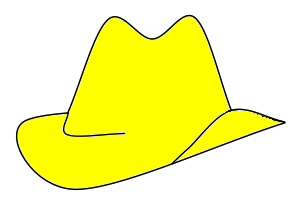 Enforce the rules strictly: what participants are asked to do in Six Hats is too counter to the way they would normally think and interact, so you must stop them from straying back into “normality”. You will need to be strict and repeat yourself. People will be unfamiliar with the process, and they will likely want to make criticisms (Black Hat) as they come to mind, rather than saving them. Have a time limit for each Hat. You may add to it if, at the end of the allotted time, there are still constructive suggestions being made. Explain that there is a time limit — this helps people to ‘shelve’ thoughts they have that don’t fit into the current Hat for the time when the appropriate Hat is in use. Organise the process. Define problems and set the purpose of the session. Set goals for the session (possibly in collaboration), think about the Thinking Hats required, and set out the sequence in which they are to be used. You decide when the group is to switch from one Hat to another. 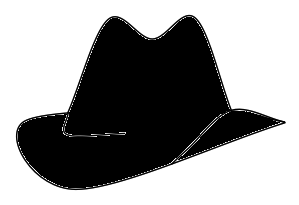 This may be done by allocating set times to each Hat, or by switching when discussion has become unfruitful. Maintain “Hat discipline” in the group. In a time allocated to one Hat, group members are to stay in that Hat (though don’t be pedantic). Maintain the group’s focus: keep people from straying off topic, clearly spell out what is needed. Asking questions helps. Provide summaries of the group’s discussion, e.g. when moving from one topic to another. To close a session the Blue Hat pulls together, or asks the group for, an outcome: e.g. a solution, a summary, or a decision. The Blue Hat is the controller of the other Hats. In practice this will often mean that one group member uses the Blue Hat all the time, acting as moderator of the process. 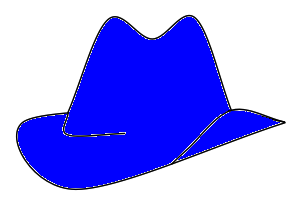 A Blue Hat phase may be used to start a session, even if one group member will wear the Blue Hat exclusively through the rest of the session. People may give input on problem definition, the purpose of the session, etc. Put forward new ideas, options and alternatives. Use ideas to get movement — to see where they will lead, where it will get you in the creative process. Sometimes ideas are stepping stones to other ideas. Some ideas may lead nowhere. You have to be able to tolerate that. Some ideas need to be shaped and nurtured; others are vague and need to be made more specific and practical. Deliberately put forward ideas that are illogical or “crazy”, as provocations to fresh thinking. You can use opposites or randomness to create provocations. You may have an acceptable way of doing something, or a product that is just fine, and feel that there is no need to look for alternatives — but what if you could improve it? This is termed a creative pause – using the Green Hat when there is no problem to be solved, no obvious reason to use it. When others put forward ideas, listen with the Green Hat on, not the Black (critical) Hat or some other Hat. Try to draw out more from from the speaker, and see if their ideas spark some of your own. Say what you are feeling. E.g., what you like and dislike. Make those feelings visible. Express your emotions at that moment. If they are different later, that’s fine. Your role is not to justify what you are feeling.In fact, you should not provide justifications or explanations. Express your first emotional reaction to an idea or proposal. “They are trying to BS us”. Express ‘intellectual feelings’, e.g. intuitions and hunches. Again, do not justify them. Red Hat gives an outlet for emotions which may otherwise be disguised as logic and argument. Part of the value of the Red Hat is its artificiality and formality; it makes it easier to express feelings by giving a defined way of doing it. We use the word intuition here in the sense of your immediate understanding, ‘feeling for’, or opinion of a situation, idea or person. It is not magical, but neither should it be ignored. It is one of several inputs into the process. Choose to be positive. Look for what is good about an idea, what benefits it might bring. Seek out what is valuable, even if it is not obvious. Put forward ideas yourself. Generate proposals. Make a concrete suggestion to move things forward. It doesn’t have to be totally novel, just constructive. Develop existing ideas, whether your own or others’. Modify, add to, and combine them. Be future-oriented, or speculative. Look to the positive aspects of what might happen. Put forward the best-case scenario. It needs to be on the map of possibilities, even if unlikely. You still assess the likelihood of something happening. Ask: what action follows on from the optimism? Is it blind hope, or is there is constructive action to be taken? Find as many reasons as possible for your optimism: information, logic, experience, or even trends and intuitions. However, you are not restricted to optimism you can completely justify. You may still speculate, as the future is not fully known. Report the facts only, without interpretation, bias, or opinion. Do not report only those facts that support an argument you wish to make. Give facts with as much precision and relevant detail as you can. “Our sales rose last year”, is not as good as “Our sales rose 14% last year; the Hardware division’s sales fell 3% and the Services divisions’ rose 20%”. List the questions that need to be asked to find out what you don’t know but need to know, and find research methods which will best answer them. Qualify the facts with your level of certainty. There are two tiers: checked facts and believed facts. Qualify the facts with their level of generality. An anecdote about a single event is at one end of the spectrum; at the other end, a generalisation proved by exhaustive research. Report the sources of the facts you contribute. Point out risks and dangers. How could things go wrong? Why should we be careful? Point out difficulties and problems. What is wrong? What does not fit? What will not work? Point out weaknesses in thinking: logical errors, misquoted facts, etc. Give reasons for your criticism. If you have a bad feeling about something but cannot put your finger on why, that belongs in Red Hat. Help to assess ideas by pointing out their weaknesses. Help to strengthen proposals by finding areas where they need to be strengthened. Anticipate potential problems and prepare for them. In Western culture, Black Hat thinking is dominant. Meetings are often a conflict between two points of view, or the justification of a pre-assumed decision against any challengers. Rarely will you see a concerted attempt to use all possible modes of thinking, like the Six Hats method. An important part of this method is that you may only the Hats at the predetermined time — most people will find it difficult not to use Black Hat thinking when other Hats are ‘on’. But it is important that you do!